One of my favorite things about organic gardening is the connection to history that we can make through heirloom varieties. Heirloom plants are open-pollinated, which means no interventions were made to cross-pollinate specifically to make a hybrid variety. Yet they have been handed down from generation to generation with consistent results. There is something particularly special about harvesting the same crops that our great-grandparents enjoyed - or the pioneers, or the Pilgrims! Heirloom potatoes are tricky thanks to the history of disease and the way potatoes are propagated, but there are still a few good heirloom varieties out there. 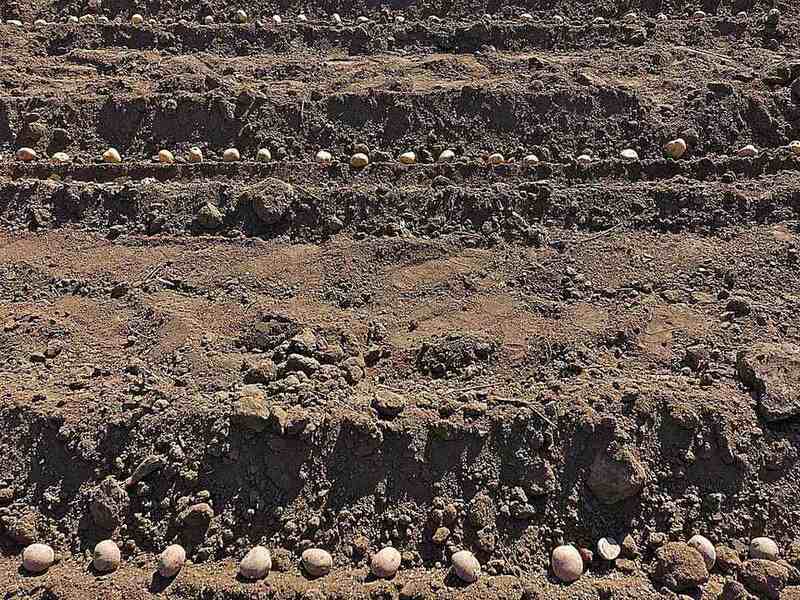 Potatoes are propagated differently than most crops. Where we might let a plant grow until it flowers and produces seeds or collect seeds from inside the fruit or vegetable, potatoes are much more reliably propagated from the potatoes themselves. In fact, potato seeds themselves are something of a secret – did you know that potatoes actually produce seeds, right from the plant? But these seeds carry a variety of genetic information, while potato cuttings are genetic clones of their ancestral line. A true heirloom plant should have consistent results when reproduced, so cuttings and eyes are the way to go for heirloom potatoes. Unfortunately, a potato’s history isn’t necessarily desirable. The Irish Potato Famine and other great disease spreads were possible in part due to genetic similarities. The varieties were all so similar that none of them were resistant to disease, allowing a fast and furious (and fatal) spread. Few heirloom varieties have lasted, and what is available must be tended carefully, as they will not likely resist pests and disease as much as we’d prefer. Hopefully, as agricultural science develops, we’ll be able to grow heirloom potatoes that have been bolstered for improved health. Still, with proactive gardening practices, there are heirloom potatoes that we can enjoy today. 'Early Ohio' Potato. Hailing from the late 1800s, Early Ohio was an improved version of Early Rose. A medium sized potato that does well in cooler climates, expect round potatoes with light colored skin to come up early in the season. 'Peach Blow' Potato. Few heirloom potatoes have survived from before 1850, but this one has stood the test of time. Named for the peach flowers the vine produces, the Peach Blow produces small potatoes with excellent flavor. 'Russet Burbank' Potato. Another descendent of Early Rose, this is the classic baking potato. You have to be in just the right climate to grow these, however. Loose soil and a Northern climate are a must. Rose Finn Apple. Originating in the Andes Mountains, Rose Finn Apple is a golden fingerling with rose colored skin. These potatoes are a treat and will keep well in storage. German Butterball. Another yellow potato, these are named for the decadent buttery flavor. While it is only an heirloom as of the 1980s, it is absolutely delicious and worth carrying on for our children and theirs! In order to grow heirloom potatoes successfully, you have to take special care to ensure growing conditions aren’t breeding pests and disease. Keeping beetle grubs off of plants is an early preventive measure. Diseases will be the bigger culprit, though, so make sure to not let it spread. Scab can be prevented in the seed stage by letting seed potatoes turn green in the sun – but only the seed potatoes! Never eat a green potato, as it carries toxins and is not edible. Well drained soil is vital, as excess moisture can harbor disease, and it’s also important to plant varieties within their time frame. Early potatoes need to be out by the time summer picks up or the heat will invite trouble. Remove diseased leaves and vines as soon as you spot trouble, and wash your hands after touching the diseased areas so that you do not spread it to the rest of the plant. One write-up on heirloom potato health suggests that smokers shouldn’t smoke around or touch potato plants to avoid transferring disease from tobacco (in the nightshade family alongside potatoes) to your crops. Heirloom potatoes are a taste of history – the cautious history that followed major catastrophes in the potato farming world – and worth the effort to cultivate for future generations. Which Pea Variety Is Right for Your Garden? Partial Shade? You Can Still Grow These Vegetables. How Are Heirloom, Hybrid, and GMO Vegetables Different? What Are Seed Potatoes and How Do You Plant Them?